Business trips, more work than I can handle, and summer events (pleasure trips) have been keeping me for updating this blog for too long already, for which I apologize. The revolutionary leader Ho Chi Minh gave its name to this city, although still today its old name Saigon is more widely used among locals. 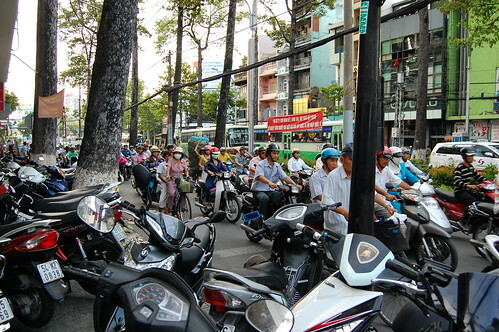 One of the first things that grab your attention in Vietnam is the amount of motorbikes everywhere. 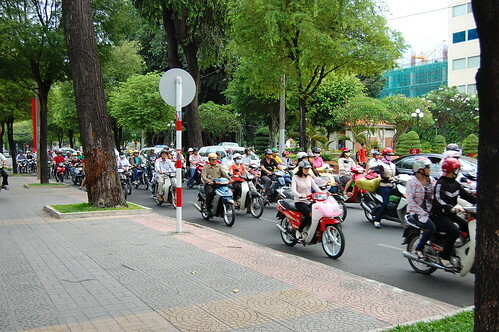 There are almost no cars (apart from taxis), but motorbikes are omnipresent. 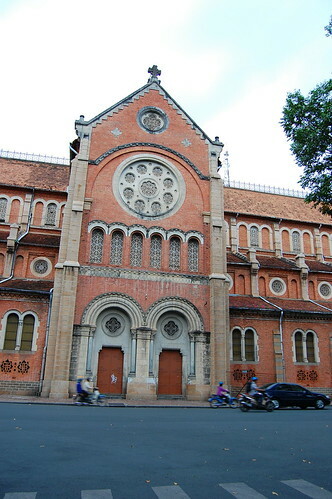 The Ho Chi Minh city hall. I was surprised to see many luxury shops near the city hall, specially considering that Vietnam is a communist country. 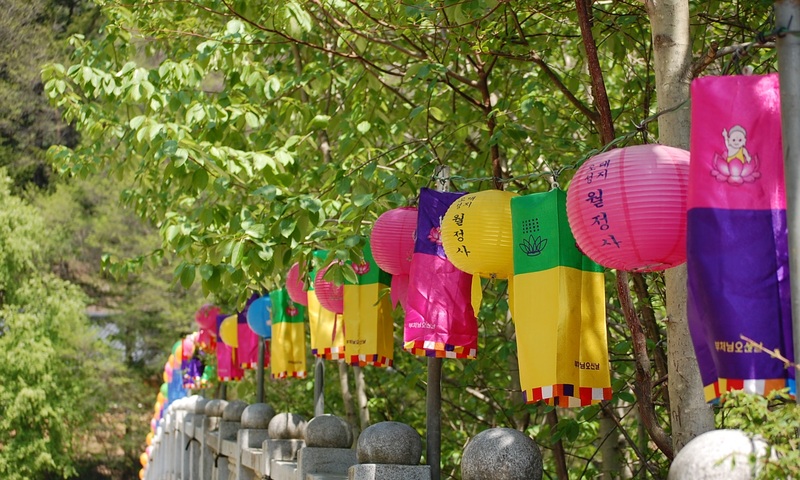 Similarly to Korea nowadays, until 1975 Vietnam used to be separated into a communist North Vietnam and a capitalist (or “less communist”) South Vietnam. 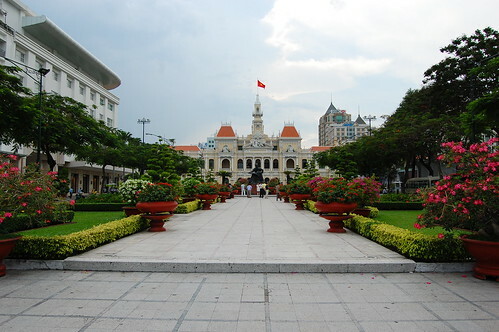 Ho Chi Minh (or Saigon as it was called then) used to be the capital of this South Vietnam. I guess this explains why the feeling in this city is not so communist. Very near the city hall, another very visited spot of the city is the War Memorial Museum. 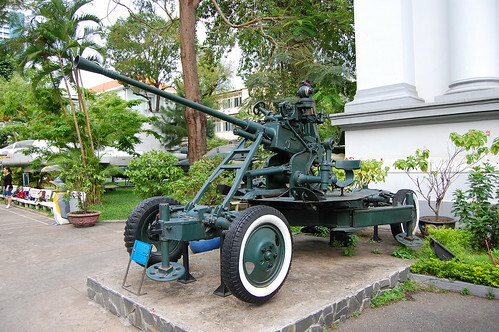 In its gardens you can find war tanks, airplanes, cars, etc. all of them from the Vietnam War. The Notre-Dame Basilica reminds visitors that this city was once French territory. 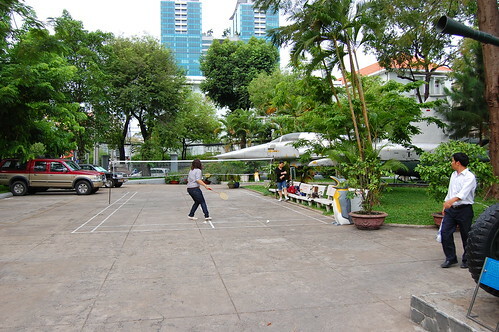 Some Vietnamese playing badminton next to an American war plane. 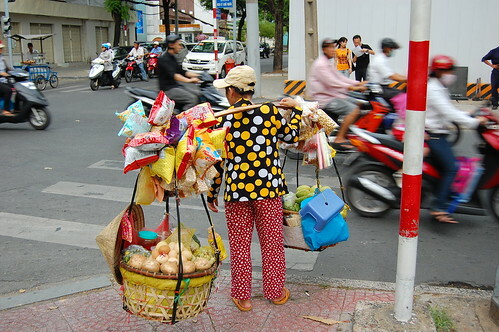 It is also common to find people like this woman carrying stuff to sell on the streets. By looking at her completely deformed shoulder, you could tell that this woman had been doing this job all her life. 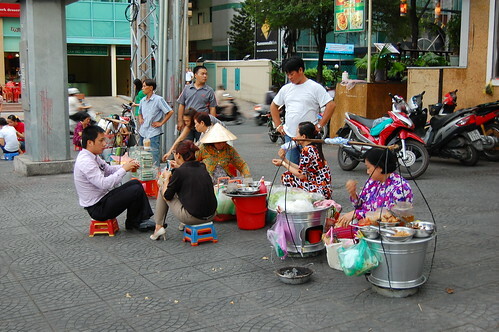 As in most countries in South-East Asia, people spend a great amount of time in the streets enjoying the good weather, shopping, doing sports, etc. 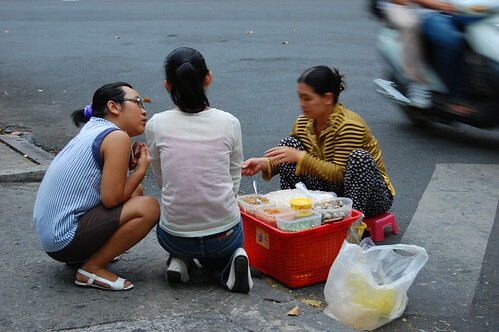 More people selling stuff outside (they are actually sitting on the road). 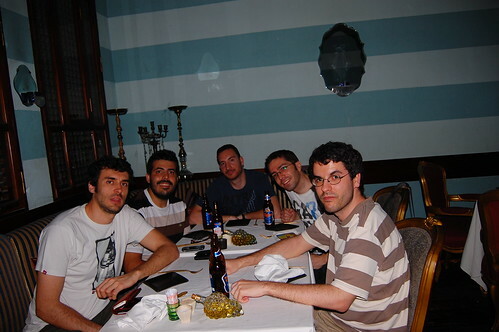 In Ho Chi Minh, I had the chance to meet Oscar, friend of Alberto and also intern at the Spanish Embassy in Ho Chi Minh. Here we are relaxing after a hard day of sightseeing. 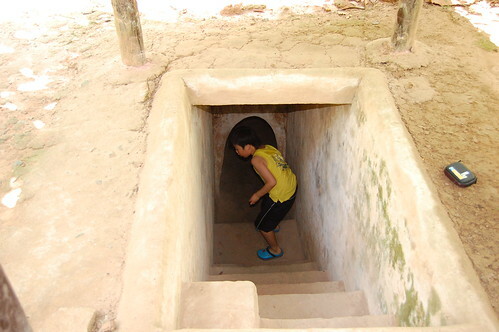 Next day we decided to visit the tunnels of Củ Chi, near Ho Chi Minh. 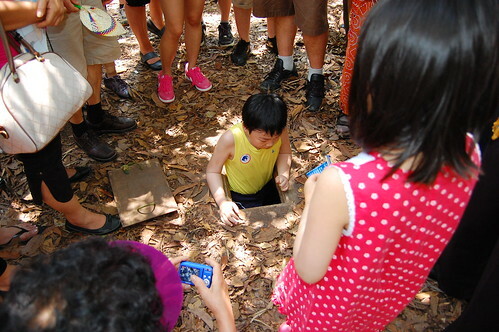 At this place you can see how many Vietnamese lived under the ground during the Vietnam War. In this picture, a Korean boy tries to enter one of these tunnels. They made the entrance to the tunnels so tiny so that American soldiers could not find them, nor enter if they did find them. This curious Korean boy could enter quite easily though. 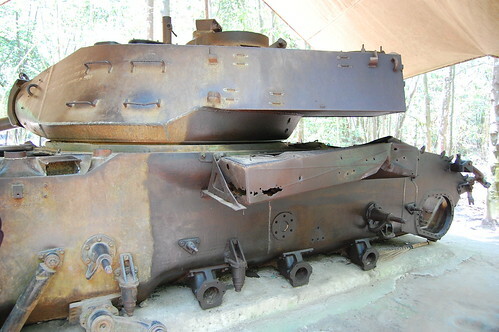 War left also many tanks abandoned in Vietnamese fields. 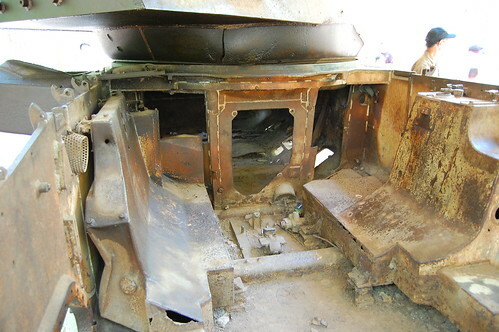 After the War, people sold the pieces that they could, like this tank without wheels. Of course the engine was also removed. 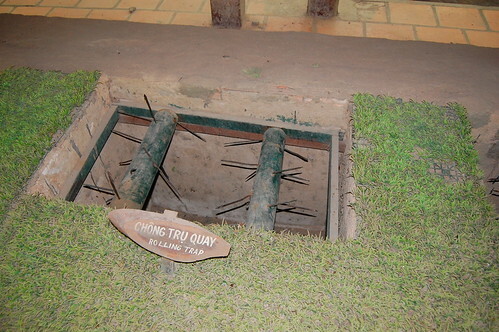 At the Củ Chi tunnels you can also see many kinds of traps that Vietnamese used against American soldiers, some of them really hurt only seeing them. There are also some tunnels that they have made available for people to enter and experience . 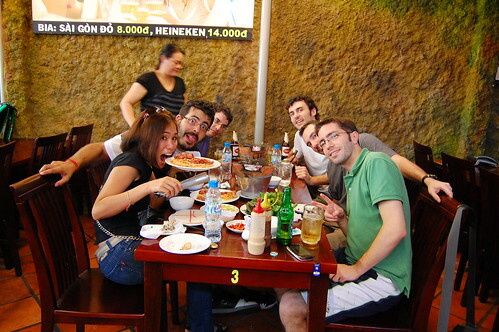 What could be better than a beer and some Vietnamese food after a hard day of crawling in tunnels?